On Sunday, eight valedictorians marched at the front of the Class of 2016 during Commencement. Seven students were recognized as salutatorians. The total number of 15 students and the eight valedictorians set new records for the College. The valedictorians are Michael Dettmer ’16, Robert Klingenberger ’16, Christopher Leech ’16, Ke Li ’16, Robert Scales ’16, Jonathan Vandermause ’16, Sarah Waltcher ’16 and Bingyue Wang ’16. The salutatorians are Stephanie Alden ’16, Claire Beskin ’16, Michael Blank ’16, Gina D’Andrea-Penna ’16, Mary Decker ’16, Axel Hufford ’16 and Alexander Liao ’16. Vandermause gave the valedictory address at Commencement on Sunday. He was chosen to do so by a selection committee representing the dean of the faculty and the dean of the College. All 15 students were named Rufus Choate Scholars, which honors the top 5 percent of the graduating class. Twelve of the honorees assisted in research as part of the James O. Freedman Presidential Scholars program. The number of valedictorians and salutatorians has increased over the past few years. Last year, the Class of 2015 recognized a grand total of 12 students at graduation, naming four valedictorians and eight salutatorians. From 2010-2015, there were on average four valedictorians and four salutatorians recognized in each graduating class. In comparison, from 2004-2009, there were on average only one to two valedictorians and one to two salutatorians recognized in each graduating class. Four of the valedictorians and three of the salutatorians are economics majors. The four math majors amongst the valedictorians and salutatorian are all double majors. Two of the valedictorians are computer science majors while two of the salutatorians are neuroscience majors. The remaining students majored in Asian and Middle Eastern studies, biological chemistry, Chinese, English, government and physics. Five of the valedictorians and salutatorians will go into finance. Two are going into consulting, two will attend graduate school and two will be working in the technology sector. Amongst the remaining honorees, Waltcher intends to go into public education, starting as a sixth-grade science teacher, Alden will take a medical research job while applying for medical school and Blank will join the Federal Reserve Bank of New York while hoping to eventually attend graduate school for economics. The honored students pointed to different keys to their success. All those interviewed, however, frequently emphasized the importance of picking classes one would enjoy in achieving academic success. Hufford chose classes based on the professor in addition to the subject. Waltcher, for her part, would shop five different classes for the first two weeks of terms to find the ones she most enjoyed. Among other reasons given for academic success, Liao pointed to the wide breadth of resources the College offered, including accessible faculty to the support of the student community. D’Andrea-Penna said her success was the result of hard work and spending sufficient time on assignments. Dettmer found seeking help from others, be it from study groups or advice from upperclassmen, crucial to achieving academic success. “I would definitely attribute [my academic success] to the people I’ve clung on to,” Dettmer said. Baskin found focusing on an assignment while studying important. When Baskin studied, she made sure to put her phone on airplane mode and do one assignment at a time. “Multi-tasking is way overrated,” Baskin said. Waltcher noted that she had the privilege of being well prepared for Dartmouth by her highly selective private school. She added that she also had the privilege of being able to study a subject of great personal interest — English. “I know not every student can take classes they’re interested in due to a variety of outside pressures,” Waltcher said. Dettmer for his part said his favorite part of being named a valedictorian was people reaching out to him who were taken surprised that he was one of the valedictorians. “For me that’s a nice validation that I haven’t made academics my everything at Dartmouth,” Dettmer said. “I had never done any coding before and it was a completely new way of thinking about things,” D’Andrea-Penna said. Those interviewed attributed the high proportion of economics majors amongst the valedictorians and to a variety of factors. Liao and Scales noted that Dartmouth is a school known for having a very strong economics department with strong scholars who will attract students. Liao also noted that economics is the largest major, making it more likely that economics majors will make up a high proportion of valedictorians and salutatorians. Dettmer also said that economics could be self-selecting in that it attracts “type A, high-achieving” students. Scales noted the interdisciplinary nature of the economics department. “The people who go into economics are typically well-rounded and that well-roundedness helps in doing well overall,” Scales said. Those interviewed attributed the high proportion of honorees going into finance to similar reasons such as self-selection among high-achievers. In addition, they pointed to financial companies’ recruiting methods. Financial companies interview candidates during senior fall and sometimes offer jobs to juniors after summer internships, as opposed to many other organizations, especially non-profits or government agencies, which only conduct interviews during senior spring, according to Hufford. “Its not that students are greedy but a lot of top-performing students like stability and being able to get a job senior fall,” Hufford said. Many of those interviewed saw the high GPA cutoff for many finance jobs as a contributing factor to the high proportion of honorees entering finance. Leech and Hufford are former members of The Dartmouth senior staff. 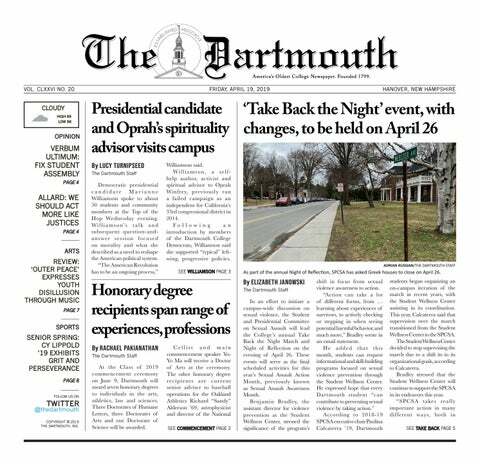 Vandermause is a former member of The Dartmouth opinion staf. Liao is a former member of The Dartmouth business staff.